Re: PocketWGU is Now Open Source! Did you take down that part? I don't see a "Development" menu item/tab anywhere on this site. Yeah, we did take down the dev pages, but not intentionally. The truth is that an upgrade on our server killed our issue tracker and we just haven't gotten it back online since. The source (although it's somewhat old) is still available in our svn repo. Are you interested in working on the project? We'd be happy to have some new members! I took a guess: http://pocketwgu.geofinity.com/svn Couldn't authenticate, though, of course. Can I have access? I have no mobile app experience, but I'd at least like to see how it's doing certain things. 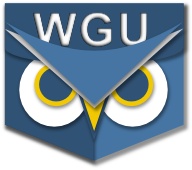 I'm a long-time web guy, and it's integration with the WGU services is something that interests me. And who knows... I might find myself contributing. I dig the app. It's very useful. Thanks for your work. Your guess was close, the link is http://pocketwgu.geofinity.com/svn/repo/trunk/ and does not require authentication. Note that this is full source for the older versions (both iOS and Android) of the app. We haven't updated this repo since the tracker went down, but it should still get you started. If there's something missing that you want to know about, shoot us an email and we'd be happy to share.